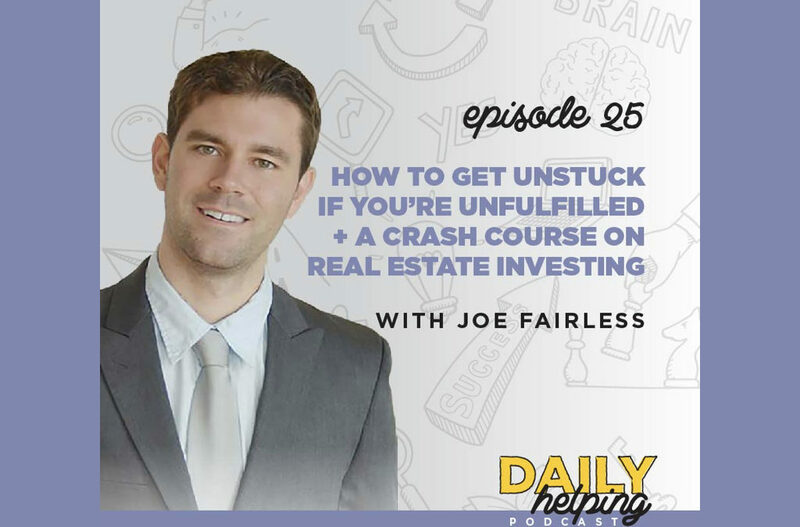 Today our expert guest is Joe Fairless, a full-time real estate investor who controls over $175 million worth of real estate and host of the longest-running daily real estate podcast, Best Real Estate Investing Advice Ever. Joe took an unexpected route into the real estate world – he started his career working with toddlers, as a preschool teacher, daycare staff, and “manny.” Of course, this naturally segued into a full-time advertising job on Madison Avenue. Even as New York’s most eligible manny and a project manager at Chiat/Day, making ends meet in the big city was hard. It was imperative that Joe honed his financial mindset. Joe started by reading, of course, Investing For Dummies. He quickly read more books and immersed himself in the real estate community – this was the key to his financial freedom. Like many of us, Joe felt stuck in a job that was, ultimately, unfulfilling – he wasn’t contributing anything meaningful as an advertiser. If you feel stuck in your job, or just at this point in your life, Joe suggests sampling new life experiences. Take an improv class, volunteer, teach, play sports, etc. Just try to identify where your focus should be in this next phrase of your life. Send an email to info@joefairless.com for a free single-family home guide. Buy for cash flow – not appreciation. Make sure you have cash reserves set aside for your purchase. Get a loan that isn’t a “balloon payment” that comes due in a short period of time. Instead, get a 30-year loan (note that this applies if you are purchasing single-family homes, not commercial real estate). Want to invest in single-family homes? Send an email to info@joefairless.com for a free single-family home guide.